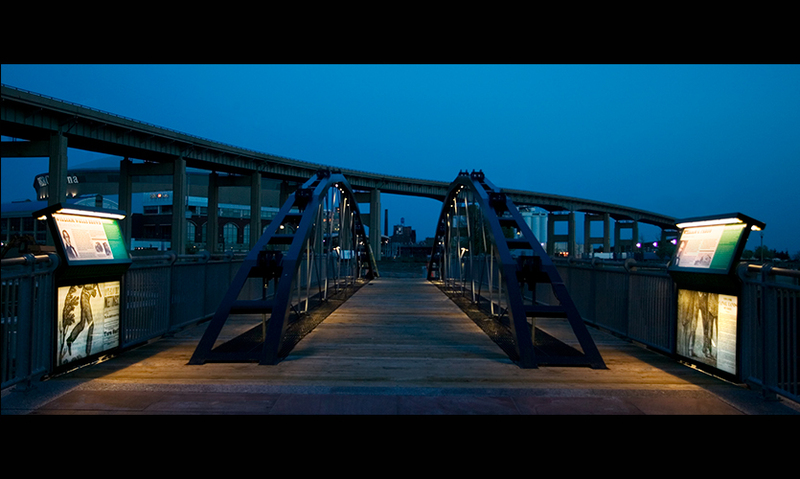 To commemorate the 175th anniversary of the Erie Canal’s opening, the Empire State Development Corp. undertook a major rehabilitation of the historic commercial slip as part of a larger revitalization plan to enhance commercial passenger and public access to Buffalo’s waterfront. 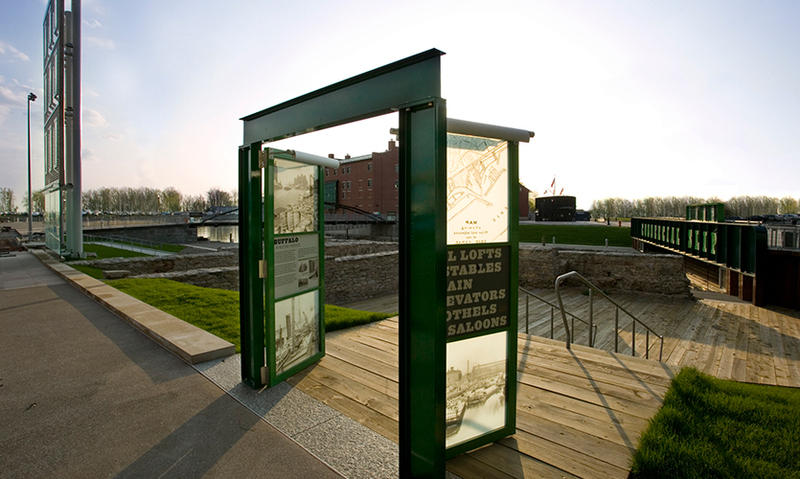 C&G Partners developed innovative interpretive elements that express the activity and scale of the Commercial Slip during its heyday as one of America’s liveliest ports for commerce and immigation. Sculptural solutions crafted from durable stainless steel, glass, and cast metal are juxtaposed with the restored harbor and warehouse remains, bridging the district’s past and future. Stories of legendary personalities and common folk are told with hands-on displays and large-scale graphics that recall Canal-era billboards and broadsides. 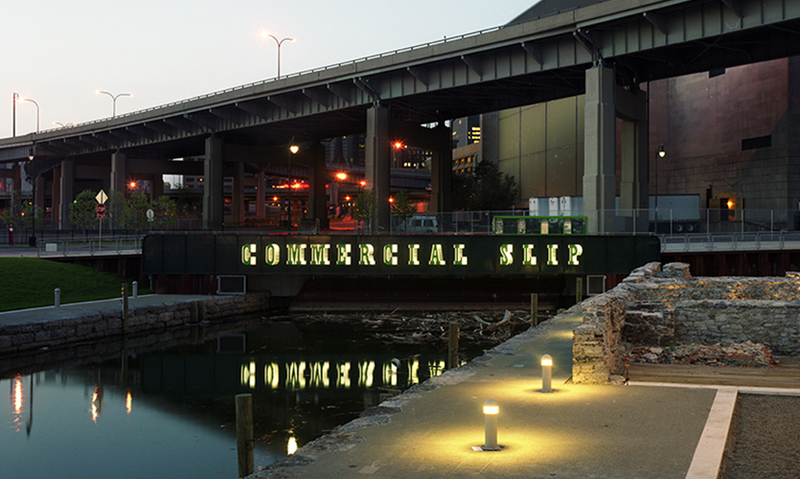 C&G focused graphic interventions on two core project areas: the restored foundation walls of the Commercial Slip (constructed to transition goods from large clipper and steam ships onto smaller packet boats) and the rebuilt Whipple Arch Truss footbridge spanning the canal. 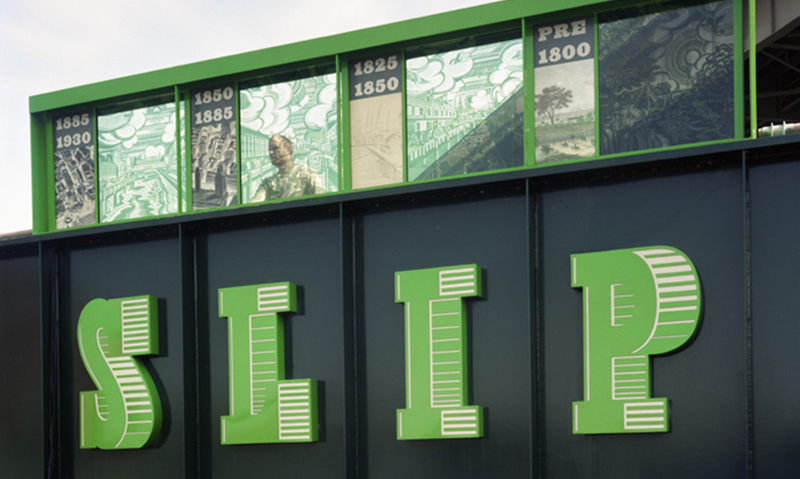 The site’s primary identification signage, attached to the I-beam railroad bridge over the canal, takes the form of 4-ft.-high can letters inspired by an 1800s broadside advertising passenger traffic on the canal. 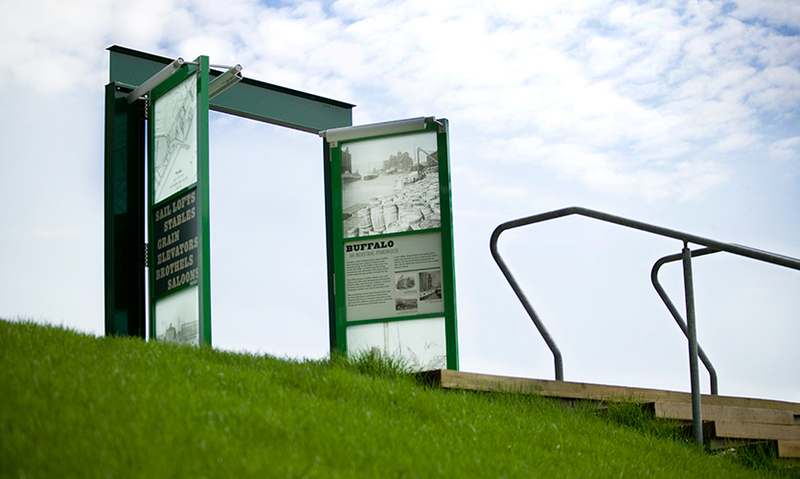 Laminated-glass interpretive panels feature original woodcut prints commissioned for the project. 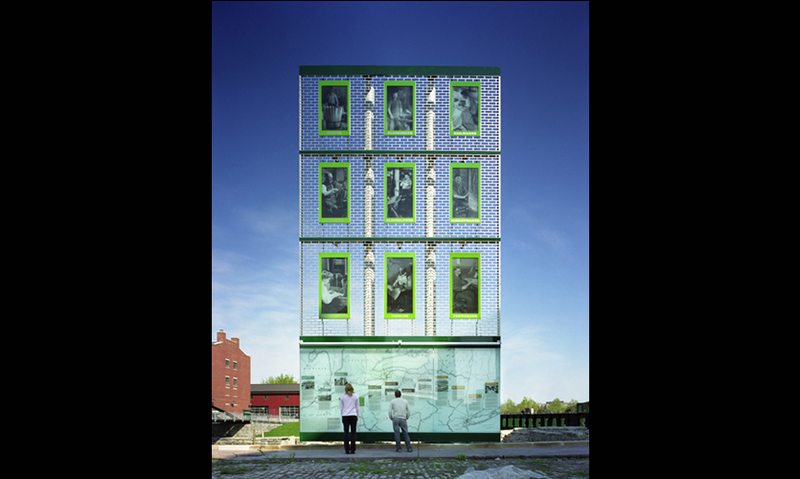 Nearby, a dramatic four-story interpretive façade evokes a canal-era warehouse and the bustling commerce it spawned. 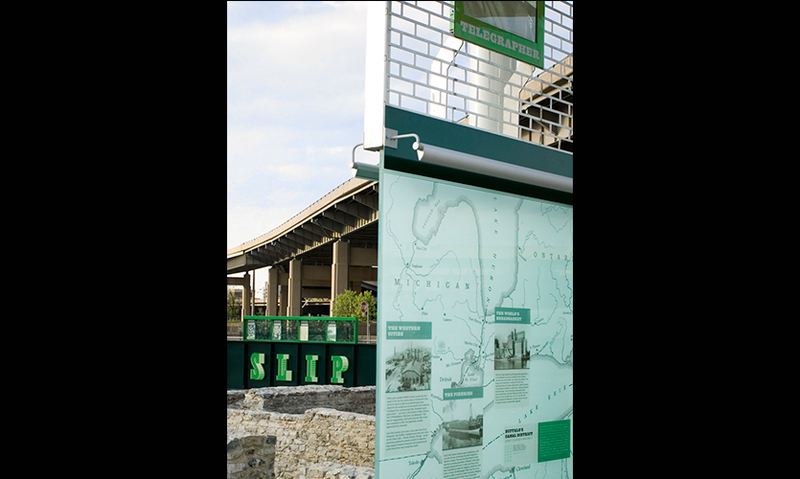 Framed in marine-grade stainless steel, its bottom third consists of a huge canal route map embedded in polycarbonate and sandwiched between sheets of DuPont SentryGlas. 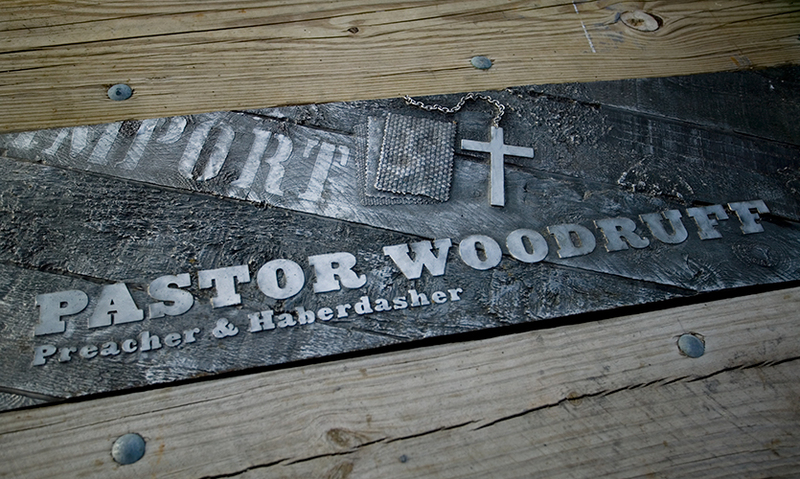 Above the map, mounted on a stainless steel tracery of “bricks,” nine lightboxes project vintage photo images of the tradespeople who would have occupied the warehouse lofts. Atop a small rise overlooking the ruins of old canal warehouses, C&G sited an evocative doorway that supports additional glass interpretive panels. 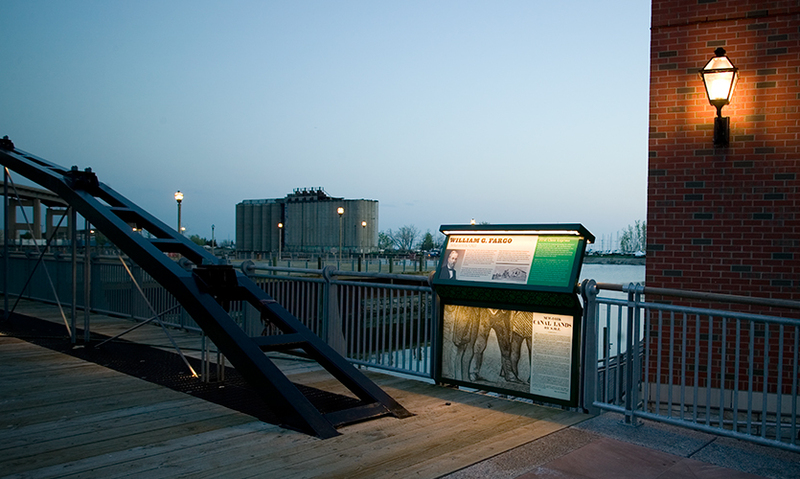 On the footbridge, interpretive panels tell the stories of legendary Buffalo personalities, while on the wharf itself, five cast stainless steel planks depict historical figures. Erie Canal Harbor Development Corp.